The Dubai-based hospitality group JA Resorts & Hotels is set to open the doors of Enchanted Island Resort – the company’s first ever internationally managed property. 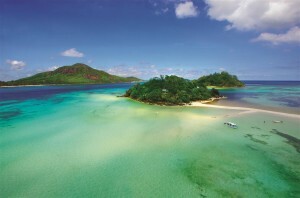 It seems that Christmas has come early for the Dubai-based hospitality group JA Resorts and Hotels, with the final preparations now in place to open the doors of the company’s first ever internationally managed property – a five-star private island resort located right at the heart the Seychelles archipelago. Set to open on the 20th December 2013, Enchanted Island Resort is a 10-villa luxury island getaway set amongst approximately five acres of lush greenery, white sands and intriguing rock formations. Situated in the middle of a designated National Marine Park, the resort enjoys an enviable location, boasting stunning views from each of the island’s boutique lodges. “The Seychelles has long been a preferred destination for travellers seeking a true island paradise experience. The Enchanted Island Resort offers just that, with a handful of limited edition villas and a unique location that fulfils the luxury 5-star brief but which is sympathetic to the environment and stunning natural beauty of the island,” said David Thomson, CEO of JA Resorts and Hotels. Comprising of eight one-bedroom villas and two two-bedroom Enchanted Signature Villas, the Enchanted Island Resort is the perfect private island destination for those used to the finer things in life. Each villa is home to its own private infinity pool, a French bathtub and outdoor rain shower as well as ample outdoor decking and a direct walkway to the beach. A collection of dining and entertainment outlets complement the boutique accommodation, including a luxury spa, a bar and a chic restaurant which serves a mouth-watering combination of contemporary cuisine and more traditional Creole dishes. In-villa dining and beachside gourmet experiences are of course also available, allowing for the ultimate tailor-made holiday experience. Enchanted Island Resort is available for rent through Vladi Island Travel – the world’s first travel operator to specialise in private island holidays. Travellers can choose to book villas on an individual basis or enjoy an exclusive island rental for parties of up to 24 guests. Head over to www.vladi-private-islands.de today and contact a member of the travel team for more information.